One of my friends has been watching her calorie intake to try to lose some baby weight after having kids. She’s been eating cottage cheese with fruit as a snack between meals, but totally getting bored of the monotony. So she asked me for any ideas of similar types of snacks she could eat. With a little too much excitement (I’m pretty sure I scared her) I bellowed CHIA PUDDING! 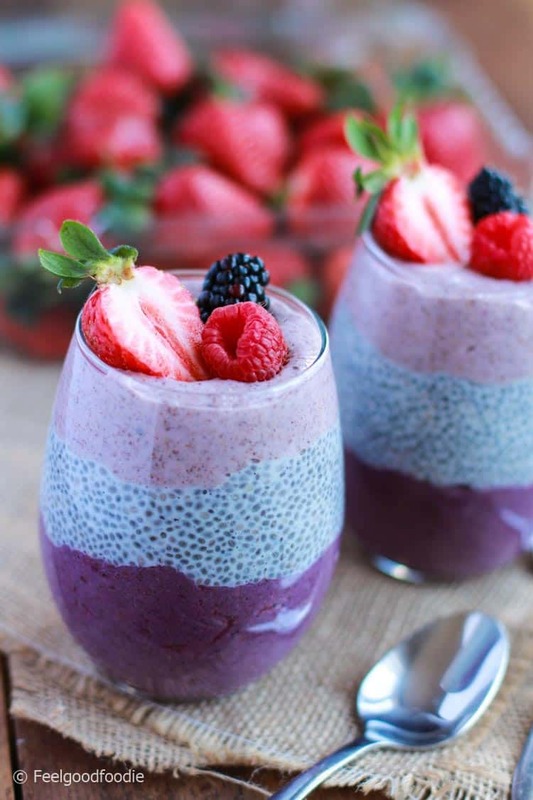 And this Berry Chia Pudding came to mind! The simple way to make it is mixing 2 tablespoons of chia seeds for every 1/2 cup of milk of choice. That’s really ALL you need. That’s how I made this other chia pudding I featured previously with a touch of honey. 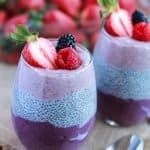 This Berry Chia Pudding is the same idea, but I blended berries with the top and bottom layers for something more delightful to enjoy with your eyes as much as your taste buds. Plus these are wonderful for entertaining because they’re easy to make ahead of time and just look so pretty! Best part is you can enjoy this Berry Chia Pudding whether you’re on a diet that’s dairy-free, gluten-free, low-calorie, low-sugar, vegan or whatever. It’s all in the pudding baby. Please note that I divided the recipe into two cups in the images so the serving sizes in the images are just a tad exaggerated for the picture effect. I suggest you divide this recipe into 4 or 6 parts though. 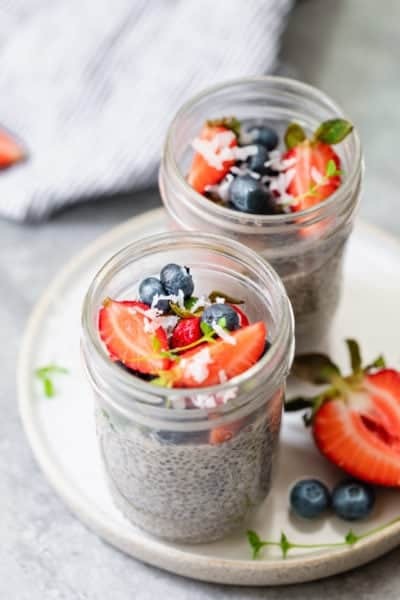 If you’ve tried this healthy-ish feel good Berry Chia Pudding recipe or any other recipe on FeelGoodFoodie, then don’t forget to rate the recipe and leave me a comment below! I would love to hear about your experience making it. And if you snapped some shots of it, share it with me on Instagram so I can repost on my stories! Pour the chia seeds, vanilla almond milk and honey into a jar and mix well. Let settle for 2-3 minutes then mix again very well until you see no clumping at the top or bottom. Cover the jar and store in fridge overnight or for at least 4 hours. The next day, place about 1/3 of the chia pudding in a blender with 1 cup blackberries. Blend until smooth and consistent and divide the mixture equally into the jars or cups. Next, layer about 1/3 cup chia pudding on top of the blackberry mixture. Finally, place the remaining about 1/3 cup chia pudding in the blender with the strawberries. Blend until smooth and consistent, and add the mixture on top of the regular vanilla chia pudding. You can garnish as you desire, and enjoy immediately or store in the fridge for up to 1 week. Can you please elaborate? Thank you! Oh I just mean that this recipe is shown in two large mugs, but it’s actually meant to be served for 4-6 people. Hope that clears it up!